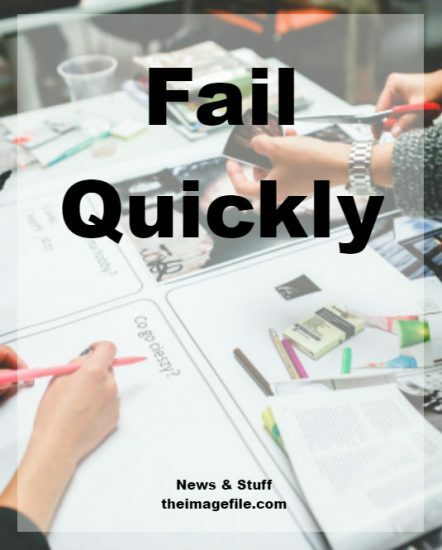 ‘Fail quickly’ is a commonly used phrase originating from the worlds of Uber and Facebook. This may result in a big sigh or the eyes glazing over. Fair enough, but it’s a vitally important point and no doubt businesses have been doing it far longer than those companies named above. Fast moving retail goods especially. if you are going to try a new product or service then commit to it and if it doesn’t work, find that out quickly so it does not cost you any more than it needs to. Put simply, if you are going to try a new product or service then commit to it and if it doesn’t work, find that out quickly so it does not cost you any more than it needs to. Hence, fail quickly! There’s nothing worse than presiding over a lost cause. It’ll poison the rest of the hard work that has gone into company. It demotivates and drives everyone slowly bonkers. Making new products in a photography market where it might seem everything has been done before could be tricky. But this is the challenge you and your company needs in order to drive the business forward and keep things fresh. Portrait parties LIVE! We’re all social now! Given that access on social media we have lots of groups on and offline. This is a fast and potentially cheap way of both promoting your business and selling products in an informal way. With the LIVE element, you can make it an inclusive event. Involve friends who are not able to be physically present. Crucially, it would get shared and become a self-perpetuating promotion tool. Go smaller for less. There are going to be gaps in your schedule even if you are really busy. Why not offer those gaps for a greatly-reduced fee? Offer a free engagement shoot as part of your package. You’re likely to make sales from this. Or at least it’ll help seal the deal for the main event. Contact other photographers with the offer to be their second photographer at a much-reduced fee. This has the knock-on effect of making more of a circular economy where you can return the favour. Have a mutually beneficial referral system with another photographer in your area. Learn film. Whilst it may be against your principles, the hard truth is that film now represents a large requirement of both business and consumer interests. In your down time, learn a few new techniques. Become au fait with this medium and it could well pay dividends as an added revenue stream in the future. Adding it as an optional extra may well gain you a few more ‘’yes’s’’, even if you don’t end up filming. Masterclasses. You are the expert. People are expecting you to provide guidance particularly as they are using their high-end phones much more. Offering tips on taking the best shots, use of light or even what equipment to buy gives you a platform from which to promote your business. And you can charge for your time. Additionally, take a stand at your local village fete. Have an open evening at your studio. Set up a pop in studio if you don’t have one. Contact your local camera club. Remember, to fail quickly is not such a bad thing. Fortune favours the brave.